I don't think I'll need or be able to scour 35+ research journals every week for new articles, so maybe I'll try to do that every other week, or maybe once a month. In any case, here's some of what was popular in the world of math education for the week of January 5th to January 11th, 2018. January 5: This article appeared once here last week, and now it appears twice this week: Sunil Singh's "Six Questions That Math Educators Need To Answer Honestly." My short answer to Question 1, "What is mathematics? ": Mathematics is the human activity of reasoning with number and shape. A slightly longer answer would explain that this reasoning produces the artifacts that we associate with mathematics, but particularly as an educator I keep the definition focused on math as a human activity, as Freudenthal did. January 6: Again: "Six Questions That Math Educators Need To Answer Honestly." January 7: Heidi Fessenden wrote "Counting Collections: One Nearly-Perfect Answer to Inclusion," a reporting of what's happening with her students when children with and without autism pair up to count collections of objects. Heidi is a thorough storyteller and it's a story I needed to hear, as I've been helping write a state policy document for students with disabilities and stories like this keep my head rooted in practice. 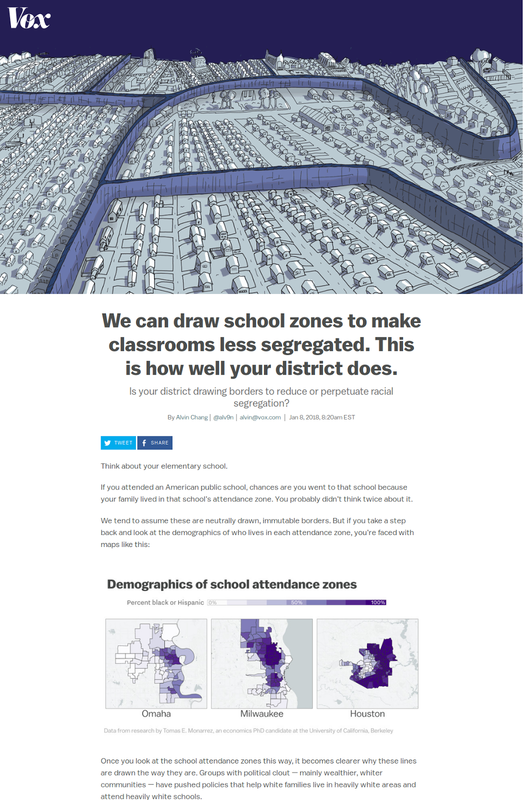 Is your district making segregation worse? January 8: Want to get lost in some policy, maps, and data? Spend your time on this feature from Vox: "Mapping the imaginary lines we use to segregate our schools." 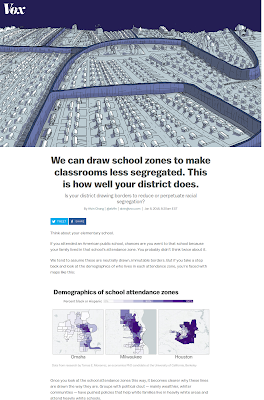 Based heavily on some new work by Berkeley PhD candidate Tomas Monarrez, you can use this tool to explore segregation patterns in districts across the country and understand the policies and historical reasons that shaped them. January 9: If you missed it on the 8th, here it is again on the 9th: "Mapping the imaginary lines we use to segregate our schools." January 10: After spending all that time looking at segregation patterns, give yourself a chance to chuckle with Ben Orlin's "Compass Constructions Made Easy." January 11: There's probably a context to this I missed, or maybe this is a new feature: A Desmos graph where the Desmos logo spins around.